Video games get a lot of negative attention these days. Too much screen time can be detrimental to physical activity and other mental stimulus (like reading). 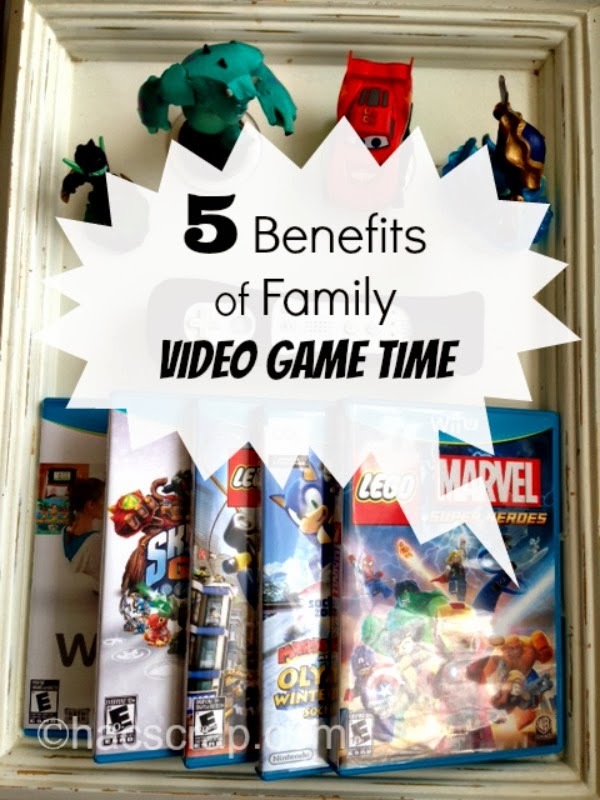 But there are also benefits to the strategy and hand-eye coordination that video games teach, not to mention what playing games (even video games) as a family can do for family wellness. The kids recently purchased the Lego Marvel SuperHeros game for our WiiU. Owen needed someone to play with, so I stepped in. I am no gamer. The kids laugh because I am typically the player pushing all the buttons and trying to figure out which one is making me jump. (then I fall off the plane anyway) But I realized that in playing this game, we were working together. Ryan came in to offer tips and encouragement, and even John had to help us get through a few levels. It became a family game. And we were playing it a LOT. I worried about too much screen time, but the benefits we were getting seemed to outweigh the negatives. Plus with all that snow, outside, we weren't going anywhere. So I did a little research on how playing games as a family made us better people and a better family unit. 1. Opening up communication. It may not be easy to talk to your child about how they problem-solve on the playground over the dinner table. But if you are Captain America, and your child is Hulk, you can get a glimpse into their problem solving and strategy skills. 2. Family bonding. Sometimes it's not easy to find common ground with your kids (especially when they become tweens and teens). Playing a game together can be that common ground, and give everyone a space to bond. 3. Getting physical, improving balance and coordination. With active games like XBox Kinect and WiiU, you can walk tight ropes, dodge soccer balls and have a dance party. When you play with your kids you can all improve your skills together - watch as everyone's best scores rise with more practice. 4. Hand-eye coordination and fine motor skills. Some of these game require hand movements while keeping your eyes firmly on the screen. With full-body motion on some games, you can even work up a bit of sweat trying to keep it all together. 5. Using our brains. Gone are the days where a video game is simply pushing a button repeatedly. Many games include strategy, logic and reasoning skills. While this a great thing for our kids, let's not lose sight of the fact that using our brains, can help keep us sharp as we age. Do you play video games with your kids? What's your favorite right now? How do you think they benefit your family?